In small, dingy bars far from mainstream rock radio, a reclusive world teems with life. Fueled by alcohol and memories of days gone by, Gen X-ers gather by the score to once again experience the music that was the soundtrack to their "better days". The success of reunion (and not-so-reunion) tours by bands such as Ratt, Warrant, and Mötley Crüe attest to the fact that audiences in the market for good ol' fashioned hard rock and metal can be found...if you look hard enough. It's that particular demographic which allows contemporary bands to find success emulating these latter-day heroes, harnessing the same raunchy attitude that once propelled hard rock to the top of the charts. Bands like Danger, Lick And A Promise, and New York's The Dead-End Kidz have latched on to that classic formula and show no signs of letting go. The Dead-End Kidz aren't quite as over the top as some bands in this genre can be, however, foregoing the teased hair and spandex and instead focusing their energy on crafting quality rock 'n' roll. 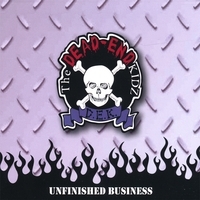 Unfinished Business is The Dead-End Kidz' second album since forming in the '90s. Musically, the album overflows with groovy riffs and slick solos from guitarists Scott Carlson and Michal LoBianco. The rhythm section of Kevin Edell on bass and drummer Tom Mahalko is first-rate, with both musicians taking prominent roles in driving the songs along. In addition to the Poison and Faster Pussycat influences you'd expect to hear, Unfinished Business is loaded with more classic sounds reminiscent of AC/DC and Aerosmith. While the nine tracks roll by at a balls-to-the-wall pace, they pack just enough variety to hold interest without becoming too distracting. Having praised the band so far, there remains one factor that all but kills the album for me. Frontman John Erigo has a style that you either love or hate, and I find myself in the latter category. He's a forceful singer but lacks the both the intensity and the character that are hallmarks of this genre, leaving the songs sounding flat and uninspired. It's always a shame when a band has a good thing going for them musically, only to stumble over the vocals. A glaring example of where The Dead-End Kidz fall victim to this is on the second track of Unfinished Business (and my favorite of the album). "The One" opens with a classic bass line from Edell (sounding very Steve Harris-like) that is soon joined by crisp riffs from Carlson and LoBianco which flow into a wistful solo. The song has a very The Cult sound to it, but the vocals bring it down for me. Erigo's vibrato isn't quite subtle enough, resulting in more of a warble than the depth of feeling that he was going for. Unfinished Business is a good album that could have been much better with a less clumsy vocal performance. Whether that comes from Erigo working hard to refine his skills or stepping aside entirely, the musicians in the band deserve a performance on the mic that is at least equal to their professionalism. I recommend this album to the most die-hard fans of '80s hard rock, but only after sampling first.